Thus began a new chapter in our building plan. We scrapped our committee approach to architecture, and looked toward that which God has handed down to us in Holy Tradition. 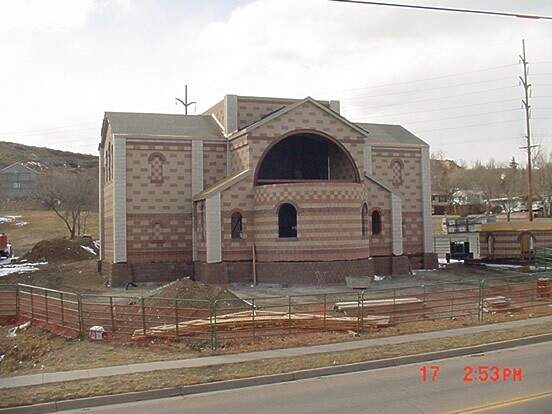 With a precedent set by the newly built St. Seraphim Church in Santa Rosa, we determined that a 12th century Byzantine architectural design would reflect who we were as Orthodox Christians in Colorado Springs—neither simply Greek, nor Russian, but truly Catholic (universal) in essence. Secondly, we determined that if we were to build at all, it had to be the “best” we could offer to God—this is not to say it would be the “best” the world could offer, but the best that we, as a people of God in this place, at this time, were sacrificially capable of offering. We would be driven not by our pocket books, giving God the “leftover”, but we must be driven by our vision of God and His Heavenly Kingdom as reflected in all aspects of our Holy Orthodox faith. It had to be costly, because God is costly; beautiful because God is beautiful, harmonious because God is harmonious, eternal because God is eternal, etc. We would build not just for ourselves, but for the generations to come after us who would be baptized, married, buried in this holy space. Finally, we trusted that God Himself would move the people toward such a project. We would not rely on our fundraising skills and “song and dance”, we pledged not to beg or cajole, but trusted in God to move the people’s hearts to give—and this He did! 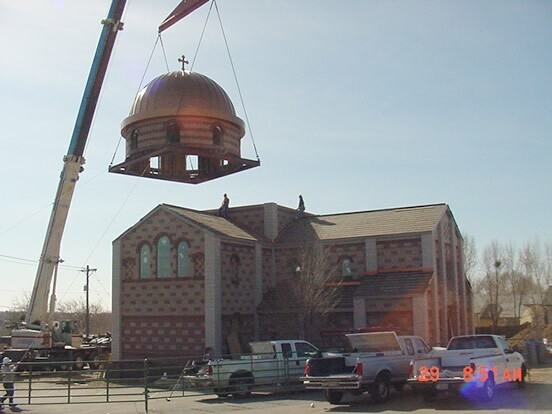 God raised up not only our own people to the challenge, but gave true sacrificial vision to our builder (Fred Fletemeyer, Inc.), the architectural firm (RTA inc.), People’s Bank (who took a leap of faith when no other institution would, due to the size of our project relative to parish membership) and even the city planning department of Colorado Springs (which granted numerous variances to the project). We planted a Cross in the earth where the Holy Altar would stand on August 5th, 2001. 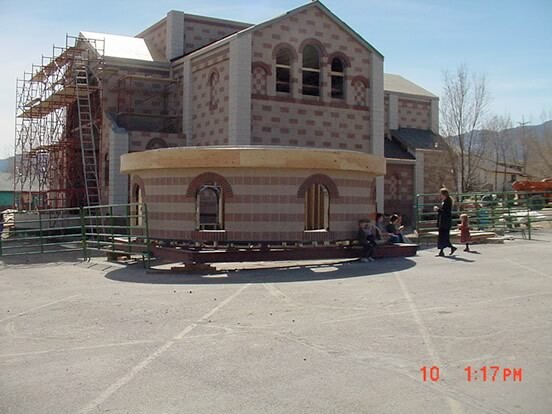 On June 15th, 2002 our first official services were held in the Theophany temple. Truly a number of miracles! The iconostasis of our new temple was done by a master carver in Bulgaria, entirely from walnut. Encho Avromov is our resident iconographer, working in traditional egg-tempora to match the style of icons to the 12th century architecture. 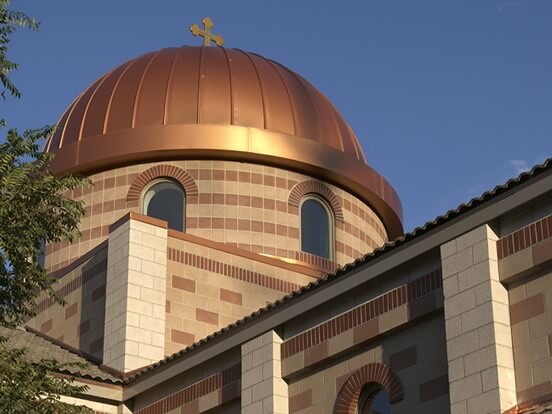 The “frescoes” on the walls of the temple are by another local iconographer and artist, Michael Greer, after the pattern and style of Dionysiou Monastery on Mt. Athos. I ask your Arch-pastoral blessing. Ss. Constantine and Helen should not compromise on the Divine Geometry, Visual Permanence, or Final Constructed Quality of the new Temple. We feel it is in the Church’s best interest to maximize the quality of dollars spent on the Temple itself, and if need be to compromise on overall size with respect to basement, etc. 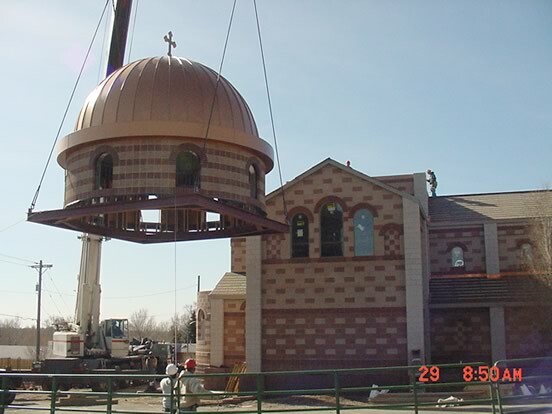 Orthodoxy involves a philosophical mysticism and an intuitive approach that is decidedly “Eastern” vs. a Western analytical approach to layout of Divine Space. 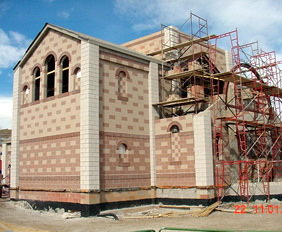 It is vital that the architecture of the new Temple reflect the distinctive theology and experience of Orthodox life. 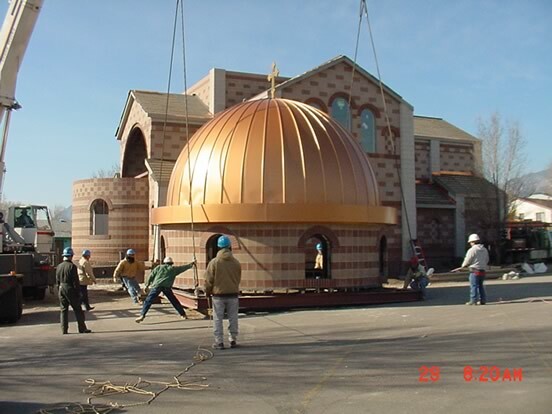 Overall sensitivity to proportion, placement of the iconostasis, the organic relationship between the apse and the dome, the importance of free and open spaces inside for iconography… all need to be thought of and planned for ahead of time (i.e. 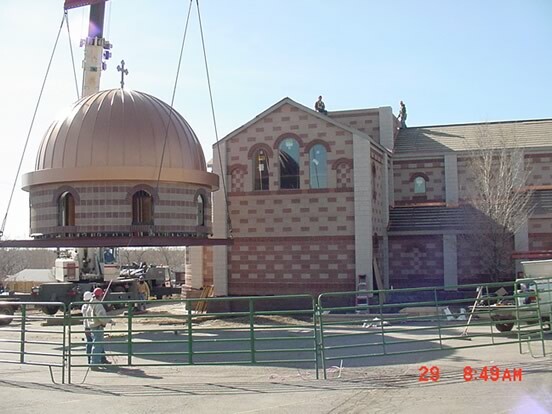 should be designed into the building) for Orthodox Sacred Space to be fully successful. This should be a temple for the ages, ideally. We need to think in terms of massing and materials that convey a sense of philosophical and practical permanence. 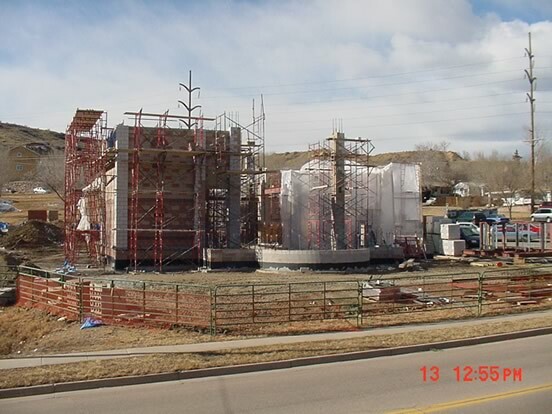 The Temple should be built to be used 100, 200, even 500 years from now – this means using such material as concrete and stone, as opposed to residential framed construction. We are more than conscious of budgetary constraints and opportunities. Taking the above into consideration and based on extended talks with a local architect and contractor, we expect to pay somewhere in the range of $160 – $200 a square foot to realistically attain our true and long-term goals. This translates into approximately $600K for the Temple as drawn (3,000 sq/ft). 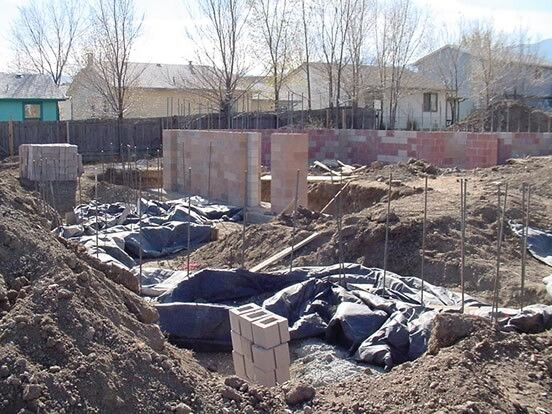 Our financial status in the building process is that we have $100K in the bank, with substantially more promised as soon as the process goes into motion. We have $0 debt, and currently run a budget surplus each month to be dedicated toward an impending mortgage. 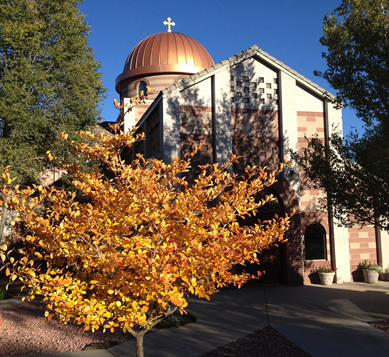 We have several catechumens, run at capacity each Sunday, with increased participation at Vespers and Feast Day services, and foresee no reason why growth will not continue, particularly with a new and more traditional Temple.